· As the focus of the drawing - Simon (male) with large muscles in a wedding dress (exactly like in the one you did for Duncan) driving a small white boat (see attached an example but must be without the roof), speeding away from a jetty towards the Sydney Harbour Bridge (see attached photo) in the background. Boat is to be labelled WATER TAXI on its side. · On the jetty is Megan (female) just wearing a towel (like the one you did for Duncan). She has a confused look on her face. The idea is that Simon has just stolen and put on her wedding dress. In background, behind Megan on the shore, is a large historic building labelled ROYAL SYDNEY YACHT SQUADRON. 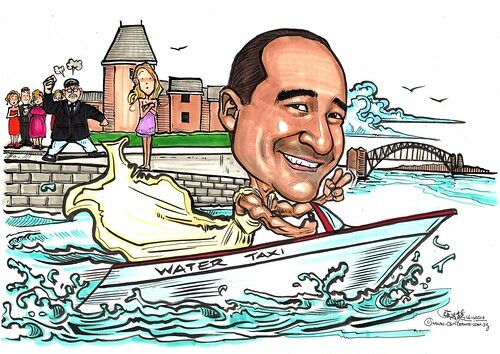 · Further in the distance from Megan near the large building is Megan’s father, Tim (male – see attached photo of Tim to sketch) in a Yacht Captains outfit with white pants and captains hat (see attached photo of example). He had a angry expression with a fist in the air directed at Simon. Please add some other well-dressed people with confused expressions near ‘Tim’ – just like you did with Duncan’s drawing. Hopefully that is not too confusing! This is a urgent themed caricature and is required no later than close of business next Tuesday 16th November. Will this be possible? As Duncan said, we'll need the caricature scanned in very high resolution and sent to me so it can be screen printed onto t-shirts." An urgent oversea order from Australia. The client subsequently change to one person caricature, while the rest are cartoon faces. Downloaded files OK. Thanks for the artwork we are really happy with it. Duncan will contact you directly to pick up original in due course.